Guelph, ON – From November 6th to the 15th, Equine Guelph’s youth program, EquiMania!, will be back at the Royal Agricultural Winter Fair to teach kids about horse health care and safety in a fun, interactive setting. Safety will be a big theme at this year’s EquiMania!. The “Play Safe. It’s HorseSense!” safety initiative will be expanded to include safety on the entire horse farm. The multi-faceted safety initiative includes a scavenger hunt on a mock horse farm where kids will be Danger Detectives investigating a dozen dangers: in the barn, around equipment (RTV), outside and around horses (including rider safety). From 1990 to 2005, 63% of animal-related injuries among youth in Ontario occurred in incidents involving horses. The majority of the injuries were caused by falling from a horse or being struck by a horse. Machine run-overs were the predominant cause of fatal injuries – at 46% – for children under the age of 16. 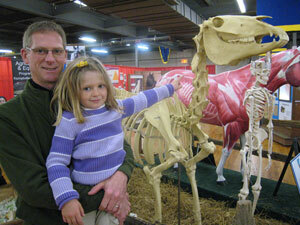 For the young and the young at heart, every visitor to EquiMania! at the Royal, upper East Annex, will come away from the education exhibit learning at least one new thing about horses. Canadian Agricultural Safety Association, Farm Safety Association, Grand River Agricultural Society, Kubota Canada, Ontario Equestrian Federation, Pfizer, Shur-Gain, System Fencing and Standardbred Canada.